KARACHI — Summers in the city — and across much of Pakistan — are relentless. Temperatures typically hit 100 degrees, power outages drag on for hours, heatstroke is common, and while monsoon rains bring some relief, they bring great ruin through widespread flooding. But there is one thing that makes Pakistanis anticipate the torpid summer months — mangoes. Last summer, Pakistani growers were thrilled at the prospect of countries beyond Asia finally enjoying their mangoes. Not only did the British retailer Asda start stocking Pakistani mangoes, but the first-ever shipment of Pakistani mangoes arrived in the United States in July 2011 after USAID helped Pakistan to meet U.S. standards of pest control and post-harvest management. New exports to Western markets were expected to be a boon to local farmers. But a big part of the shortfall is due to poor logistical planning: containers needed to ship mangoes are in short supply; Pakistan International Airlines does not appear to have the proper infrastructure to make shipments; international shipping companies have transported mangoes to the wrong destination or failed to secure the fruit against damage or theft en route; a cumbersome distribution system has caused Pakistan to lose out in the Asian mango market to China and India. 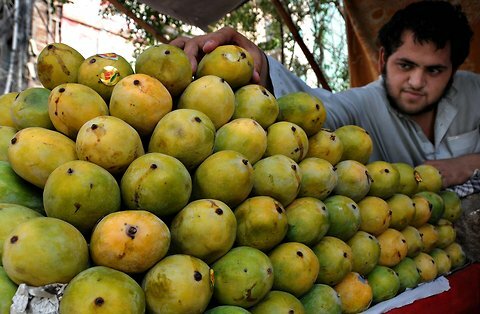 Meanwhile, U.N. sanctions against trade with Iran have also caused a loss of $10 million to Pakistan’s mango growers, who previously exported up to 40 percent of their crop to the neighboring country. All this bodes poorly for the future. Meagre profits — or in some cases, losses — from exports, coupled with last year’s widespread damage to mango farms, could compromise future yields. This would be nothing less than tragic, especially given that a worsening economic and security situation means that there are ever fewer things for Pakistanis to enjoy. I, for one, am not taking any chances. This summer, I’m scarfing down mangoes at every opportunity. But my real hope is that the Pakistani mango’s reign endures for many years to come. When U.S. Secretary of State Hillary Rodham Clinton offered Pakistan help last week in exporting mangoes to the U.S. in a bid to dampen anti-American sentiment, it marked the latest chapter in the fruit’s curious history of diplomacy and intrigue. Clinton’s offer came three years after the Bush administration opened up the U.S. market to Indian mangoes in exchange for allowing Harley-Davidson to sell its famed motorcycles in India – a deal that generated goodwill as the two countries finalized a civilian nuclear agreement. 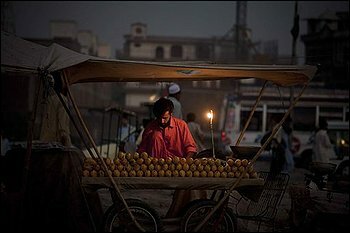 Washington’s mango-powered diplomacy this time around is part of a broader $7.5 billion aid effort that is meant to improve the image of the U.S. in Pakistan, a move officials hope will provide the Pakistani government with greater room to cooperate on turning around the war in Afghanistan. Officials from both countries have exchanged crates of mangoes over the years in an attempt to soften tensions between the nuclear-armed rivals that have fought three wars since the partition of British India created the two nations a little over 60 years ago. Former Pakistani President Zia ul-Haq may have begun the tradition when he swapped mangoes in the early 1980s with the Indian prime minister at the time, Indira Gandhi. The exchange took place several years before ul-Haq was killed in a plane crash that conspiracy theorists blame on a crate of mangoes placed on board moments before takeoff that was supposedly sprayed with a poisonous gas that killed the pilots and other passengers. But like almost everything else, mangoes have also been a source of tension between Pakistan and India since the two countries view each other as competitors in the export market. Indians and Pakistanis argue over who grows the best mangoes – a debate that resembles the tussle between Lebanon and Israel over who can claim the mashed chickpea dish hummus as their own. If all goes to plan, Americans will get a chance to conduct their own taste test once Pakistani mangoes break into the U.S. market. The U.S. plans trial shipments later this year and has pledged to support a three-year program to promote the export of Pakistani mangoes by sea to America, the world’s largest importer of the fruit. The initiative is part of a $21 million program to boost Pakistan’s agriculture. The U.S. will help finance hot water treatment facilities, sorting and grading machines and cold storage facilities. India, meanwhile, is the world’s largest mango producer with about 13 million tons each year, far exceeding all other countries, including Pakistan, which comes in fifth place with about 1.6 million tons. But both countries have struggled to build the necessary infrastructure to really boost exports. But it remains to be seen how quickly Pakistan can benefit from Clinton’s recently announced initiative. India had trouble with logistics and pricing when it first tried to export its mangoes to the U.S. It is even more uncertain whether U.S. aid will really dent anti-American sentiment in Pakistan and motivate the government to step up support for the Afghan war, a move the Pakistanis have resisted for years.